"Put your trust in your captain. I am your only hope." Most people should be familiar with at least some of the work by author Jules Verne, who pioneered the fantasy adventure genre with books such as Around the World in 80 Days, The Mysterious Island or 20,000 Leagues Under the Sea. Reworked by his son Michel before being published posthumously in 1905, Le Phare du bout du monde (The Lighthouse at the End of the World) tells the story of a lighthouse keeper on a remote island in the South Atlantic, who battles a group of pirates out to exploit the rich shipping lanes of Cape Horn. Guarding the southernmost tip of South America is a lone lighthouse, there to warn seafarers of the treacherous waters below. For Captain Moriz (Fernando Rey), it is his life's duty to make sure the light always shines, and is instructing an apprentice, Will Denton (Kirk Douglas), on the upkeep of the lamp. Denton is a man with a past, who has come to the island in search of a new future, and the isolation here suits his purpose, as contact with the outside world is limited to the infrequent resupply ships, who arrive only every few months. When a sailing ship enters the harbor, Moriz rows out to meet the captain, unaware that these are pirates about to take his life and control his island. Witnessing the events from land and unable to do anything to help, Denton escapes to the hills, as the pirates make for shore under the leadership of Jonathan Kongre (Yul Brynner), but an aggressive manhunt fails to find the lone survivor. While able to elude capture, Denton also stumbles on a storehouse of stolen loot, but his ability to remain free is jeopardized when the pirates quell the beacon, allowing them to sink a passenger ship. They slaughter all but two of its occupants; a man Denton helps free, and a young woman bearing a haunting resemblance to Denton's lost wife, who is captured by Kongre. The pirate captain is up to the challenge of playing mind games, and when he discovers a locker with Denton's belongings, comes up with a ruse to lure the man into his trap. Confronted with his past, Denton sets out to rescue the woman, but isn't expecting what he finds. It's a battle of wills between the pirate captain and the light keeper as to who can control the island, and The Light at the Edge of the World. The film holds up as an exciting, old style action adventure. The scenic locations provide a great backdrop to the story, and the many confrontations between the leading men have a legendary air about them—it's not like the outcome isn't obvious, but getting there is fun. Both Kirk Douglas and Yul Brynner (in one of his favorite parts) excel in their respective roles with theatrical performances. Samantha Eggar provides a fairly uninspired female counterpoint that both men prize. 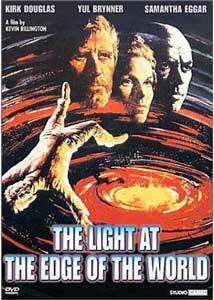 While not up to the standards of some of his other, more popular work, for fans of classic Jules Verne drama, The Light at the Edge of the World makes for an enjoyable experience, perfect as a Saturday matinee. Image Transfer Review: The anamorphic 2.35:1 image is quite good overall, with strong colors and good black levels. The source print has areas that are in moderately rough shape, with a few tears, and some excessive speckling, but the bulk is more than acceptable. Grain is naturally rendered, and there is no excessive sharpening. The image is a touch on the soft side, but again this looks intentional. Audio Transfer Review: Mono audio is presented well. The soundtrack is fairly loud, with a dynamic mix contrasting the crashing of waves with more subdued ambience. While a little on the bright side, the track has good spectral coverage when required. Extras Review: The pirates must have plundered any goodies that may have been found for this film, as there are no extras to speak of. The main menu also contains the chapter stops. Pirates ships, canon battles, and a match of wits anchor this island adventure in classic Jules Verne style. Image turns in a decent transfer on an otherwise bare bones release of this Spanish production, helmed by fine performances from its cast. Fun family entertainment, except for the monkey.